Back to School - Make your own Pencils! It’s back to school time. Labor Day always marked the return to school from summer vacation when I was growing up. I was always excited to get back to school, for all the right reasons of course. You know, new school supplies, new clothes, and of course seeing my friends regularly. So when this months topic for Ornament Thursday was announced to me, Academia, my first thought was freshly sharpened pencils. 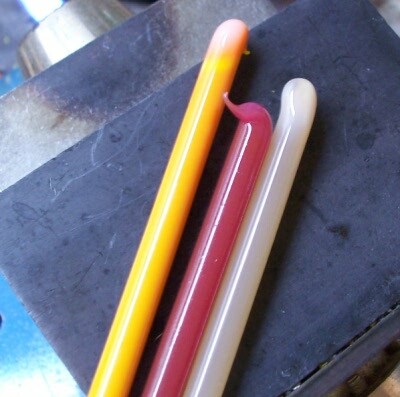 I know, I’ll make little glass pencils. Wouldn’t they make great teacher gifts? Of course, I had to choose the colors. 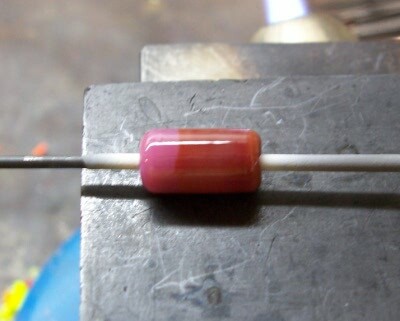 I use Bullseye glass, so I picked, regular pink for the eraser, pumpkin for the pencil, and nougat for the tip. Then I added just a bit more pumpkin to the pencil part and rolled it out all nice and smooth again. This is what it looked like right before I put it into the kiln. 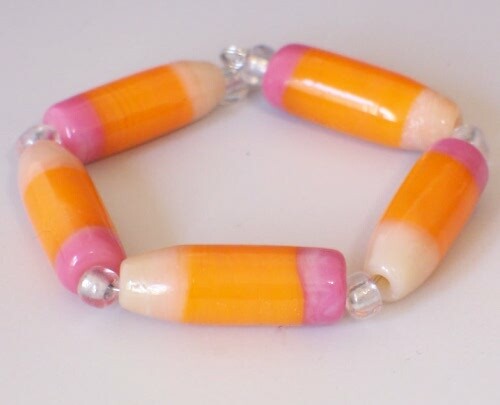 Then of course they need a jewelry designer to make them into something. So what did I do? I sent them off to JoolzbyLisa. 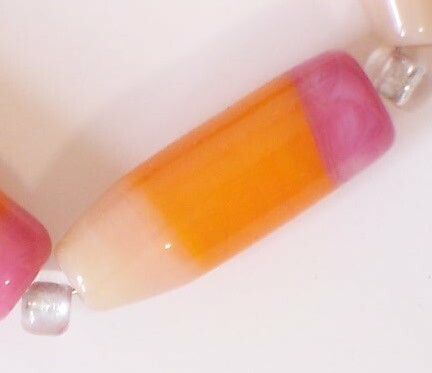 She has a post on how she transformed these little gems into adorable jewelry. Click here. 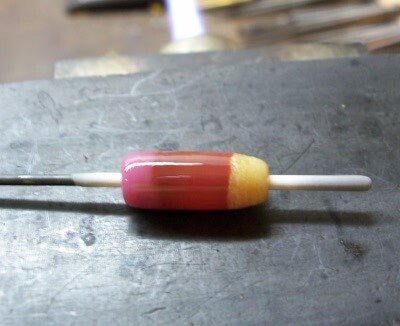 So now you have the tools on how to make pencils and I have just directed you on where to go for info to make them into jewelry gems. 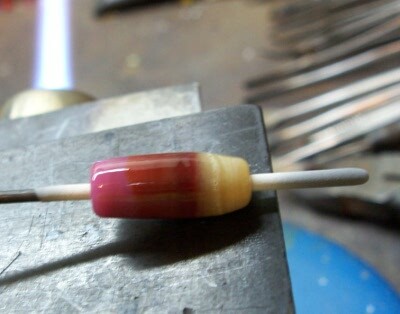 But, if you are not a lampworker and want pencils, go here to see some in my etsy store, or contact JoolzbyLisa for pencils made into jewelry. 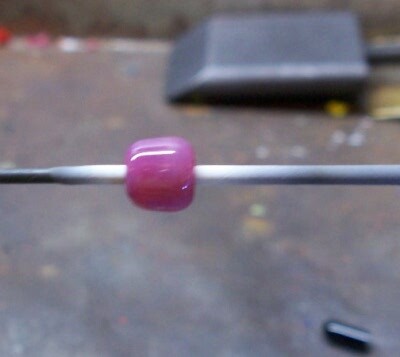 The Art Bead Scene editor shares a few words of wisdom for jewelry designers. Lynn Kvigne to read! While you can easily use a scrap of paper or an old magazine subscription card for a bookmark, why not whip up a stylish book mark instead? Cindy’s learned how to Mail! Swelldesigner goes crazy over school supplies! Michelle’s School Book – it’s academic!